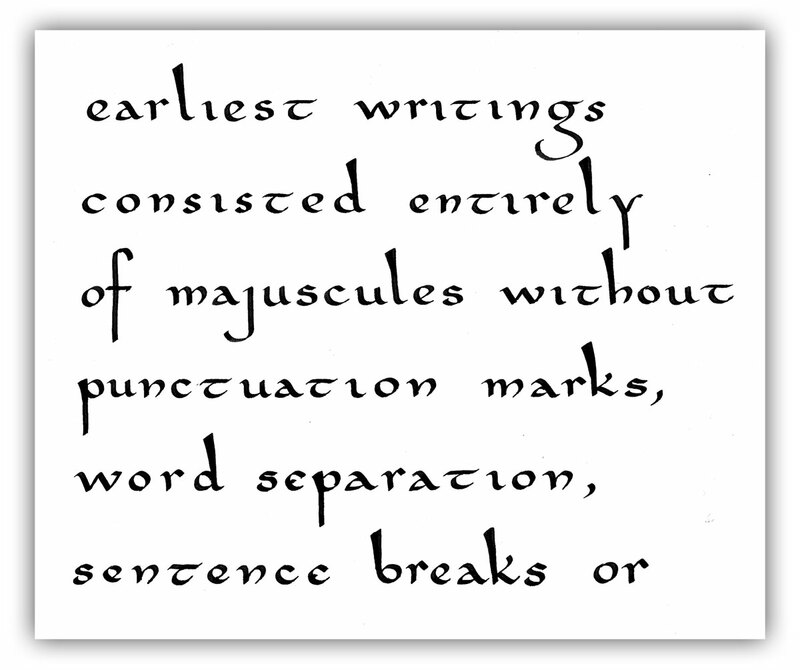 The scribes surely cursed Johannes Gutenberg for perfecting the revolutionary technique of printing by moveable type, and for bringing an end to an era of hand-lettered manuscripts. 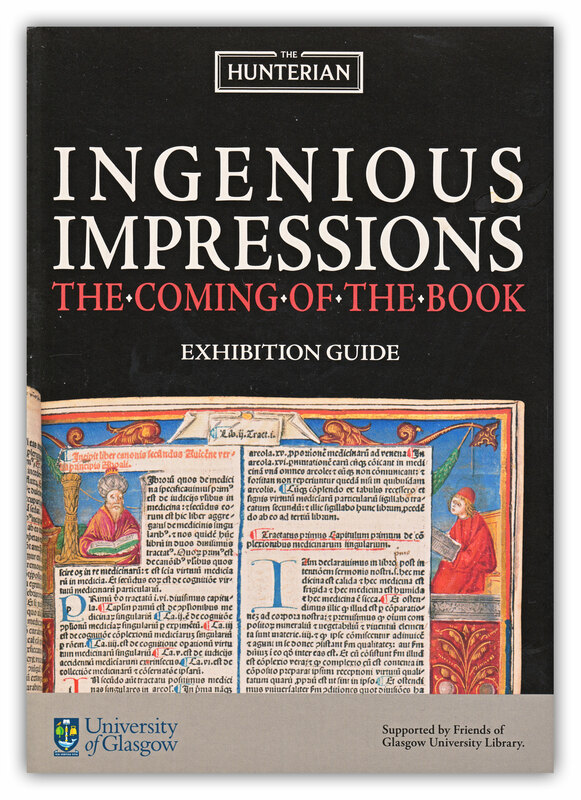 The exhibition, Ingenious Impressions: The Coming of the Book, explores how the invention of mechanical printing impacted on late medieval society. It charts the development of the early printed book in Europe, showing how printing revolutionised book making, and was instrumental in the emergence of the Renaissance. There are a number of key themes, including the transition from scribal to print culture, the design, decoration and illustration of the earliest printed books, and the technology and challenges of printing. There are also demonstrations on a replica 15th century printing press. 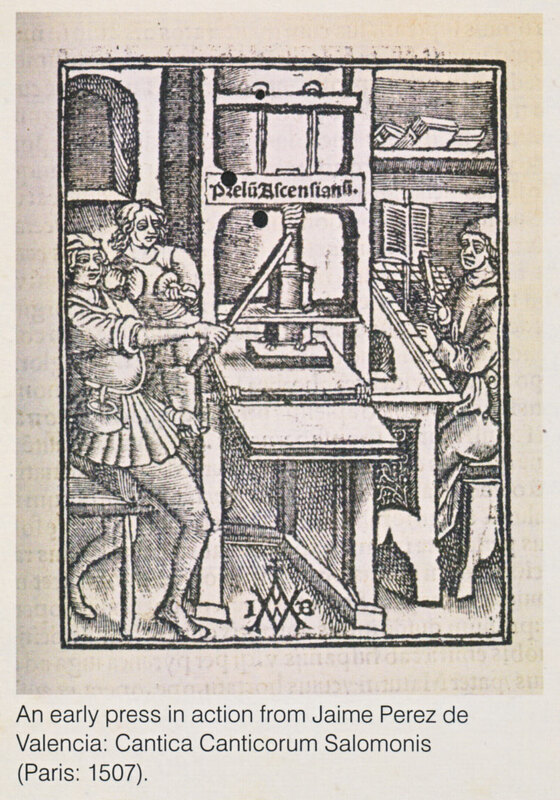 I assume that, with the advent of mechanical printing, the majority of scribes would have found their services gradually dispensed with in the mid 15th century. But it’s heartening to know that during the early years of printing, the same artists who provided illuminated decoration in manuscripts were employed to illustrate printed books, a space having been left on the pages for them to add illustrations by hand. Eventually, as featured in the exhibition, woodcuts were used to provide illustration on the printed page so, despite being granted a reprieve, these talented artists inevitably followed the same fate as their fellow scribes. This fascinating exhibition is being held in The Hunterian Art Gallery, within the University of Glasgow, and runs from 27 February till 21 June 2015. It is open daily, except Mondays. Admission is free. More information is available here. There are various related events taking place throughout the term of the exhibition, but I was drawn to the title of one event in particular. Considering it is part of an exhibition about 15th century printing, Johnny Depp and Old Books: Incunabula in the Movies definitely caught my attention. If you are as curious as I am about the subject matter, maybe I’ll see you in The Hunterian on 27 May. If you live in central Scotland, or are willing to travel, then I would definitely recommend visiting Ingenious Impressions: The Coming of the Book. The exhibition had initially slipped under my radar, so I’m grateful to Phil, one of my intermediate calligraphy students, for bringing it to my attention. Thank you Phil… just one instance of the teacher learning from the student! Easter is almost upon us, and I’ve just realised that I haven’t posted anything new since last Autumn. Six months of silence, which is shameful. Such evidence would suggest that I’m not worthy of the title, “Blogger.” But I’m back now, better late than never, and determined to make amends for my inexcusable absence. In timely fashion, while I was considering various topics, I received a comment referring to a previous post that I wrote about The Demise of Calligraphy. In that post, I featured a photograph of a bookcase shelf, packed with my personal collection of calligraphy books. The comment that I received was from Rachel, who requested a list of the books in the photo. So, I decided that, rather than respond directly to Rachel, I would list my collection of books in a post, adding my personal thoughts about a few of them along the way. Yes… I know… there’s nothing more boring than a list. I do appreciate that… and I accept that I run the risk of sending you, dear reader, to sleep (or off to some list-free calligraphy blog). But hopefully my personal thoughts will help break up the bullet points, and alleviate the potential for yawns and drooping eyelids. A plus for me is that writing this post gave me an excuse to create a new piece of related artwork, which I’ve featured above, or view it on Flickr. This is my most recent book purchase. I bought it because I admire Gaye Godfrey-Nicholls’ calligraphy, particularly her italics, which have had a great influence on my own lettering. 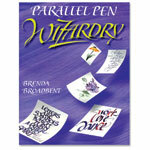 Her book covers both traditional and contemporary calligraphy (including digital). It features outstanding and varied examples of hand-lettering, and includes profiles of many calligraphers, some of whom are unfamiliar to me. There are interesting chapters on pointed brush, flat brush, pointed pen and ruling pen. 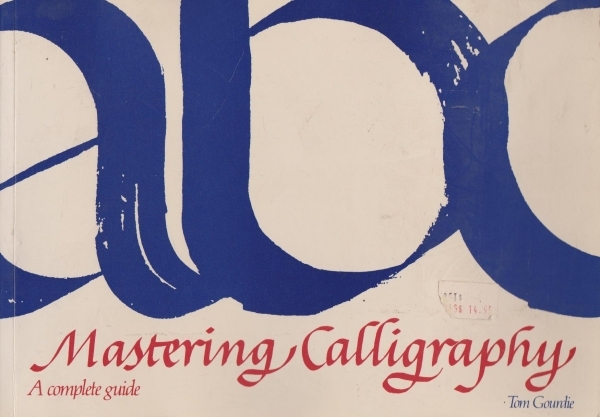 And I am particularly interested in the chapter on ‘Gestural’ calligraphy, a fairly modern approach to rhythmic letter-making that I am keen to learn more about. The book is lengthy, (as is its title) at almost 300 pages, so very good value. And definitely a great buy for anyone seeking an effective all-rounder. Whether or not you buy the book, you should visit Godfrey-Nicholls’ Inklings website, and prepare to be inspired. She is a seriously talented, and prolific, calligrapher. 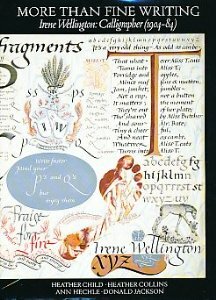 This book relates the story of Irene Wellington’s life, and features numerous examples of her awe-inspiring calligraphy. It is not an instruction manual, yet there is much to learn just by admiring the colour plates of her lettering, something I tend to do a lot of. A few years ago, while I was reading the book, my wife noticed that I had been staring at the same colour plate for more than fifteen minutes. Curious, she asked me why. (Her question broke the spell, or else I may be staring at the page yet). The truth is, oblivious to the passing of time, I had been tracing pen strokes with my eyes, calculating pen angles, analysing the spacing, deconstructing the composition, appreciating the near-perfection of Irene Wellington’s lettering. But, conscious of how odd such an explanation would appear to my non-calligrapher wife, I lied. I told her that I had simply been daydreaming. Yet, despite its potential for turning me into a disingenuous husband, this is a wonderful book, and I never tire of leafing through it. These are ‘simple’ calligraphy books, and I mean that in the nicest possible way. There is nothing fussy or complicated about their content or approach… just straightforward examples of professionally executed calligraphy, and practical ideas about how to put your calligraphy to work. 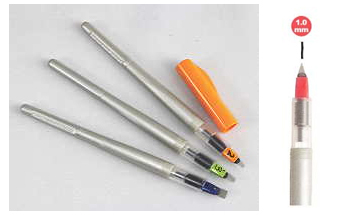 I still use wonderful Osmiroid calligraphy fountain pens and nibs, despite the company going out of business in the 1990s, so I have a soft spot for these three books, which bear the Osmiroid name. Speaking of soft spots, these three books mean a lot to me. Mainly because I attended a calligraphy class back in 1987 that was taught by the late Tom Gourdie. As I explained in a previous post, that two week class changed my life. I purchased my copy of Calligraphic Styles directly from Mr Gourdie in the classroom, and I am honoured that he signed and dated it for me in his fine Italics. 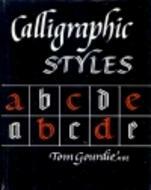 Calligraphy has moved on since these books were published, but if you are seeking instruction that is presented in a pure, honest, uncluttered format, then purchase any book by Tom Gourdie. 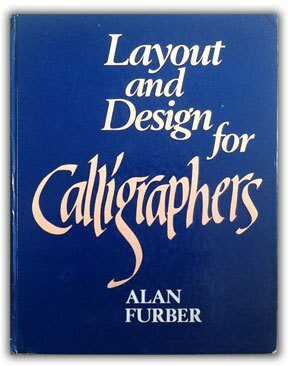 Another four books that were influential when I was teaching myself calligraphy back in the early 80s. 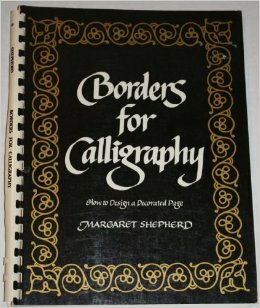 Although Margaret Shepherd’s lettering styles differ greatly from Tom Gourdie’s, the two author’s books share a simplicity that I believe is advantageous to anyone setting out to learn calligraphy. 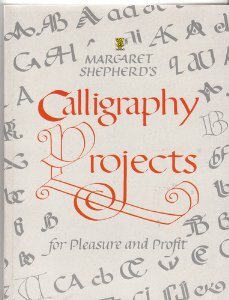 Calligraphy Projects is a particularly useful book, in that it shows many ways in which calligraphy can be put to practical use. If you are learning calligraphy, but don’t know what to do with your new-found talent, Calligraphy Projects will certainly come in handy. Two books that I cannot recommend highly enough. If you want to learn about calligraphic composition, layout and design, you should buy these two books… today! I have already featured the books in a previous post, in which I wrote extensively about their merits, so I urge you to read that post rather than I repeat myself here. 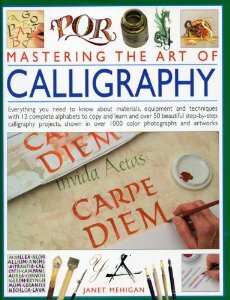 If I was asked to recommend a single calligraphy book for the beginner, this is it. 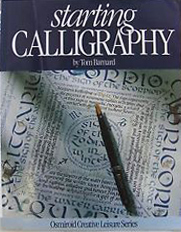 I suggest to all of my calligraphy students that they should treat themselves to a copy, because it is an amazing all-rounder… professionally presented in full colour with clear instruction, practical projects, and a gallery of top-class calligraphy. Required reading for every incipient scribe. 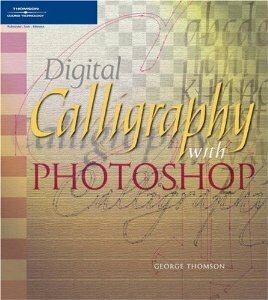 Anyone who is competent at calligraphy, is computer literate, and has a scanner and a software package such as Adobe Elements or Adobe Photoshop, will find these two books invaluable. They explain how to transfer calligraphy from ink and paper onto a PC or Mac, to be viewed on a monitor. Once the calligraphy is ‘digitised,’ the possibilities are endless. Resize and recolour lettering at the click of a mouse. 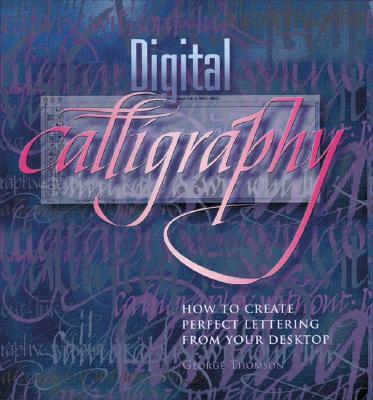 Easily reposition lines of calligraphy to try various design solutions. Add a subtle shadow effect or glow (but be careful not to overdo the novelty aspect), then reproduce the completed design on an inkjet or laser printer. These two books have proved to be invaluable to me. 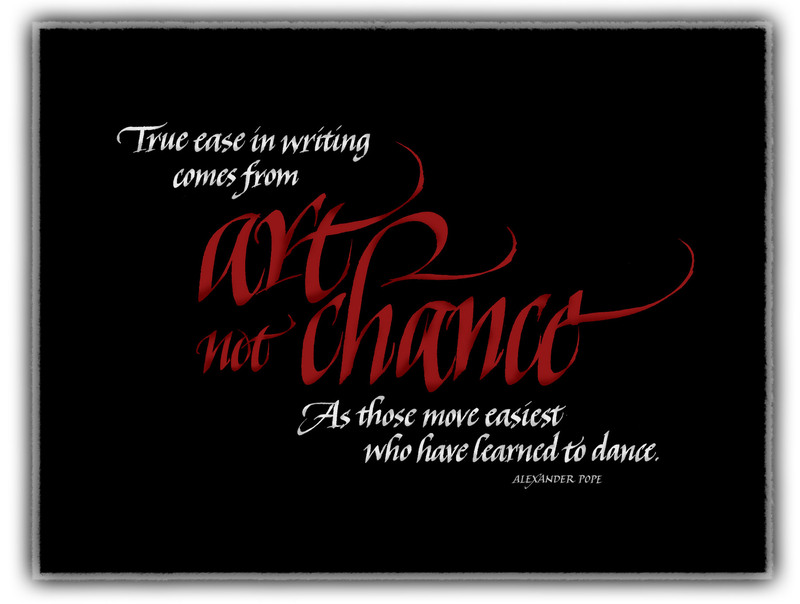 I learned so much from them, and almost all of the calligraphy artwork that I now produce is created in digital form, using techniques that I learned while following George Thomson’s instruction. The books are not for everyone, particularly not for calligraphy purists or traditionalists, but would benefit anyone wishing to create contemporary calligraphy in a digital form. 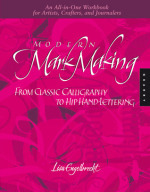 Speaking of contemporary calligraphy, this is a book that drags the craft into the 21st century. Modern, bold, brash and vibrant, every time I leaf through its colourful pages, I’m compelled to get my pens out and start lettering. One word of caution: whenever I teach calligraphy, I always begin with the Foundational alphabet. It’s the natural place to start, and every available calligraphy book will back me up on that… except Modern Mark Making. Curiously, it starts with Italics, a very unusual choice. But the book is all about breaking rules, experimentation, taking risks, and above all… enjoying the art of letter-making. So I think Lisa Engelbrecht can be excused for dismissing Foundational in favour of having fun. If you own a set of Pilot Parallel Pens, do yourself a favour and buy a copy of this book. These pens are an amazing writing tool, particularly their potential for colour transition, and the book is their perfect companion, telling you everything you need to know about them. Although it is a very slim volume, at only 26 pages, it is definitely worth owning. On behalf of one of my calligraphy students, I recently tried to source the book in the UK, but without success. 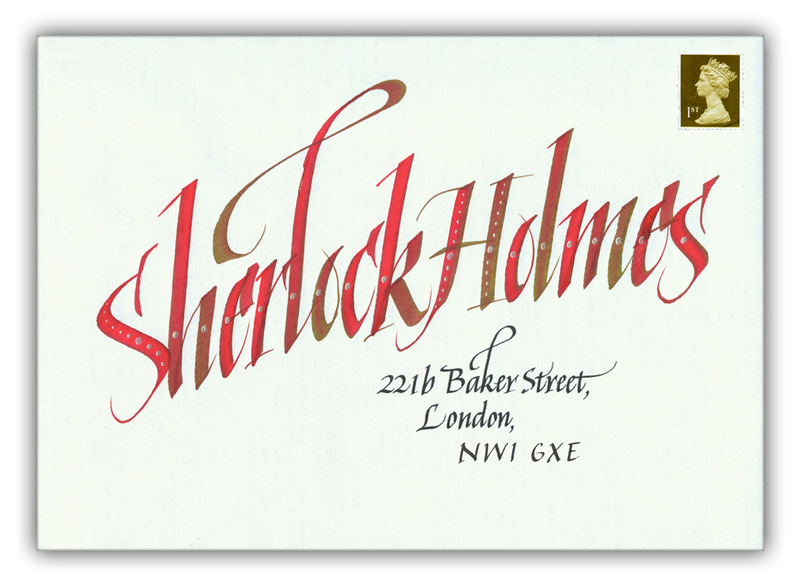 So calligraphers in the UK may need to order from a US supplier, such as John Neal. Despite the extra effort and extra postage costs that would entail, I would still recommend the book to all owners of Pilot Parallel Pens. Although I have given the above books my special attention in this post, the following books in my collection have also played an important part in my progress as a calligrapher. These books may have been slightly less of an influence than those described above, but each of them is worthy of inclusion in any calligrapher’s book collection. And that’s it. For a list, it wasn’t so bad, was it? I’m hoping that at least some of you who started reading actually got this far. I thank you for your perseverance. And I thank Rachel for her comment that inspired this post. If anyone owns a worthy calligraphy book that I haven’t mentioned above, please leave details in the comments below. I’m always on the lookout for new sources of inspiration. The Amazon links included above will allow you to read reviews about the books, but don’t forget to visit Calligraphity, the online calligraphy bookshop. Yes… I know… you came here looking for information on calligraphy, and were greeted by the front cover of The Joy of Scrapbooking. But despite what you’re thinking, I haven’t gone over to the dark side. I’m still a calligrapher, not a scrapbooker. And if you bear with me you’ll find that there’s method in my madness (and maybe a little madness in my method, but you can be the judge!). Of course, it is advantageous for an incipient scribe to be creative, imaginative, and naturally good at art. Calligraphy projects will definitely benefit if executed by someone possessing those qualities. But such qualities are not essential in the quest to become a competent calligrapher (in my opinion, the requirements are guidance, application, discipline, lots of practice and patience). Despite my profession, I confess that I don’t regard myself as naturally creative or artistic. And although I’ve been producing original calligraphic artwork for the past twenty five years, ideas have never come easy. The problem is I have little, if any, imagination. Many years ago, as a school pupil in art class, I had no difficulty drawing a still life. If a vase of flowers was placed in front of me, I could produce a passable sketch in no time. But if I was asked to draw something from my imagination, without any props, I was incapable. If I couldn’t see it, then I couldn’t create it. And, all these years later, little has changed. 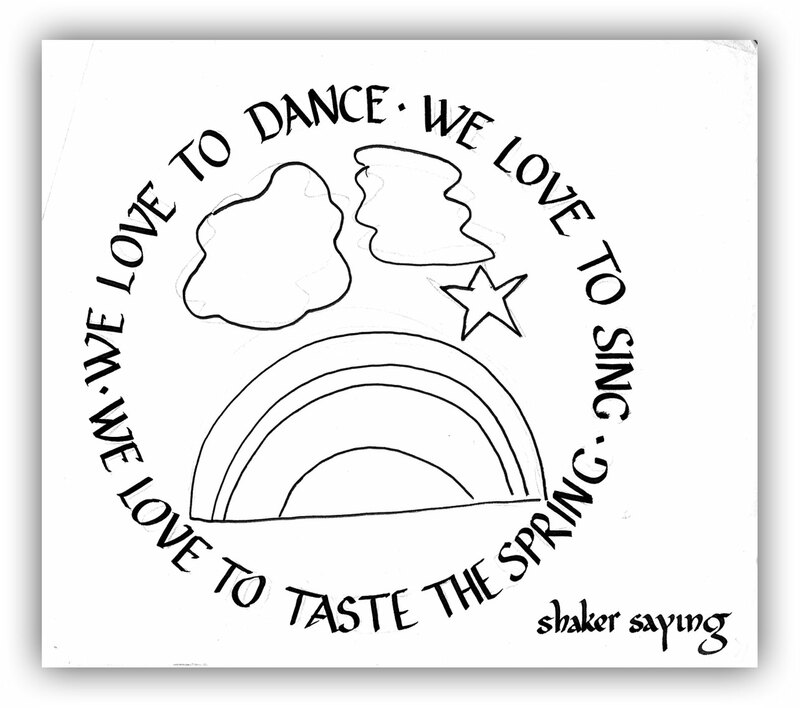 My calligraphic creativity requires kick-starting from visible sources. 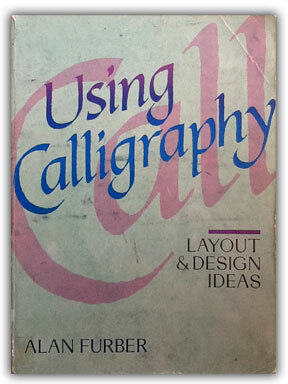 For decades, when seeking such inspiration for my artwork, I scanned my many calligraphy books for ideas. I didn’t copy or plagiarise other calligraphers’ work. I was simply looking for appropriate design layouts and colour schemes that inspired me. As soon as that initial spark fired up my creativity, my own talent and expertise took over and saw the job through to completion. Searching through those calligraphy books worked for a while, but I eventually became so familiar with their illustrations that they no longer did the trick. I began to look for inspiration in design books with a typographic slant, since remaining within a lettering context seemed to be a natural progression. 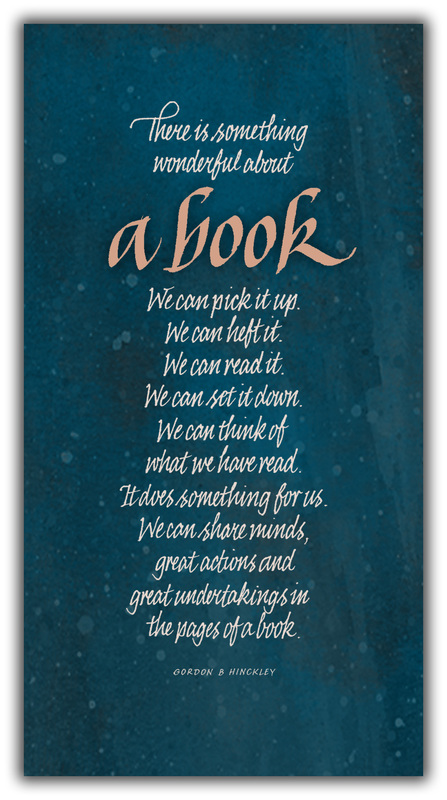 I was immediately inspired by the content of many excellent books including, Roger C Parker’s Looking Good In Print, Robin Williams’ Design Workshop, and Leslie Cabarga’s Logo, Font and Lettering Bible. But I didn’t appreciate how much I was limiting my progress by seeking inspiration only within the confines of the lettering arts. That changed unexpectedly a few years ago when I found myself in a Glasgow bookstore, browsing books in the arts and crafts section. 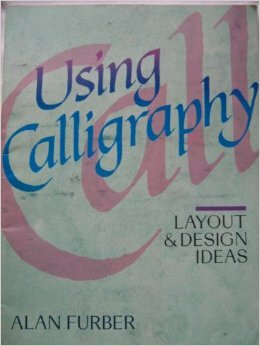 Having exhausted the calligraphy and typography books, and with time to kill, I began to idly leaf through books on crafts that held no interest for me… or so I thought. I’m not sure what I expected to find when I opened a copy of The Joy of Scrapbooking, but it certainly wasn’t the treasure trove of original designs and amazing colour schemes that confronted me. I was transfixed. Up to that point I knew nothing about scrapbooking (I still know very little), but the more pages I turned, the more enthusiastic and inspired I became. The book was crammed with amazing examples of scrapbooked artwork that incorporated well-executed typography and occasional examples of hand-lettering. And I was knocked out by the original design layouts, varied colour combinations and wonderful textures. A bonus was the inclusion of tips on digital scrapbooking that I could easily apply to my digital calligraphy projects. Before I knew it, I was at the checkout with my credit card in one hand, and The Joy of Scrapbooking – my new favourite reference book – in the other. This unexpected discovery taught me to expand my horizons in terms of where I sought inspiration for my calligraphy, and I began to unearth further resources within non-calligraphic books. A fine example is Peter King & Company’s,1000 Greetings, which features inspirational designs in the form of “creative correspondence for all occasions.” I discovered the book by accident in my local library, which was a lucky break, since its illustrations have sparked my creativity on numerous occasions. In my experience, it is natural and easy for calligraphers to play safe, and stay within the boundaries of the lettering arts when seeking calligraphic inspiration. Yet other crafts and disciplines have much to offer… it’s just a matter of making the effort to peer over the boundary fence once in a while to check what’s on the other side. So, the next time you are in a bookstore, stride past the familiar calligraphy section and browse some random craft books instead… you never know what you might find. 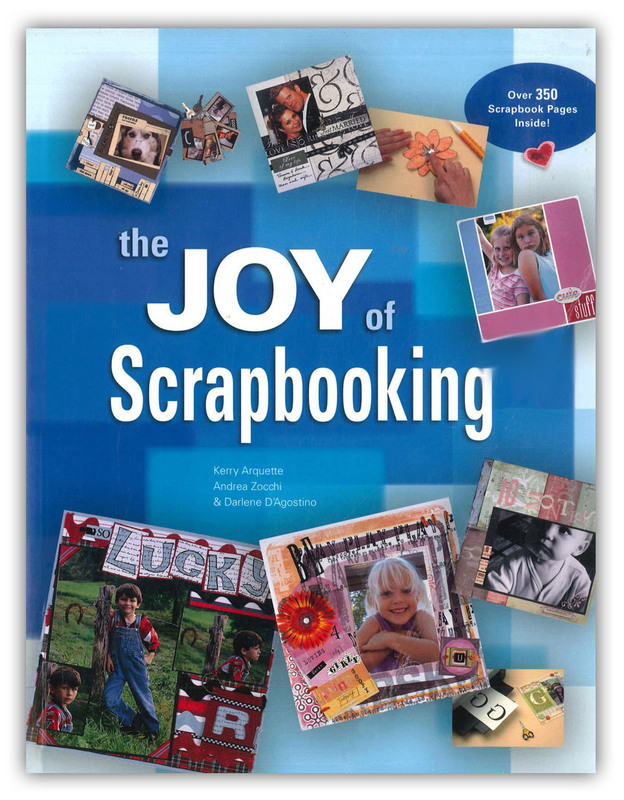 And, if all else fails, you can always buy a used copy of The Joy of Scrapbooking from Amazon for £1.89 plus p&p (at time of writing). It definitely worked for me. If you are a calligrapher, and have been influenced, motivated, or inspired by non-calligraphic sources, I’d be delighted if you left a comment sharing your discoveries. I’m always on the lookout for new, quality, calligraphy books, and this morning I discovered a new book about lettering called Hand to Type which fits that bill perfectly. A small section of the book can be browsed at Gestalten.com, and the examples of calligraphy and lettering look absolutely stunning. On the same website I discovered the above short video about Jessica Hische, a young letterer and illustrator, whose personal thoughts on certain letters of the alphabet make for interesting viewing. If you have five minutes to spare, I can definitely recommend that you watch the video. Gestalten.com contains other lettering-related videos, and its book section on typography contains many books that I would love to own. 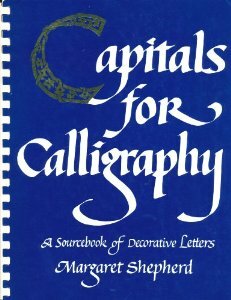 I’m now saving my pennies so that I can add a copy of Hand to Type to my burgeoning collection of calligraphy books. The RRP on Gestalten.com is £35.00, but Amazon presently offer it here for £24.57 with free UK delivery. Browse Hand to Type at Gestalten.com. I’m sure you’ll be as smitten as I am. While visiting Edinburgh a few days ago, I entered a large high street bookstore to check if there were any new calligraphy books on offer. In the Craft section I found a sign that stated, “Craft books displayed alphabetically,” so I searched along the spines in the general direction of “C”. Books on Basket Weaving, Beads, Bookmarks, and Buttons were all present and correct. As were Candles, Ceramics, Collage, Crochet, and Cross Stitch. But there was an obvious omission. I considered that the books on calligraphy must have been misplaced, so I went back to “A” and carefully worked my way through the entire Craft section, all the way from Applique to Wreaths, but there was not a single calligraphy book to be found, misplaced or otherwise. I approached an assistant and asked him where I could find calligraphy books. “In the Craft section,” he said. “I just checked there, and there’s nothing,” I replied. He tapped his computer’s keyboard and peered at the stock list on his monitor. He shook his head and I feared the worst. “I’m afraid we don’t have any calligraphy books,” he said. “To be honest, there’s not much demand for calligraphy books these days,” he said, and I almost gasped out loud in the face of such effrontery. During the 25 years that I have been involved with calligraphy, I have become used to seeing the same old familiar titles on bookstore shelves. But never before have I drawn a complete blank. Despite the assistant’s comment, I simply refuse to accept that there is no demand for calligraphy books, and my current class of sixteen incipient scribes would surely back me up on this. The experience has been bugging me for a few days now, and I’m close to penning a letter to the bookstore to point out the error of its ways. I’m even considering writing it in a fairly flamboyant fashion, just to prove that calligraphy is alive and well, and is no less deserving of representation in the Crafts section than Crochet or Cross Stitch. The next time I’m in Edinburgh, I’ll make a point of checking out the Craft section again. Hopefully, the inclusion of a few calligraphy titles will have pushed the Buttons and the Candles books a wee bit further apart. And, you never know, their availability might even spark a resurgence of interest in calligraphy in Edinburgh. A demand for calligraphy books must surely follow. 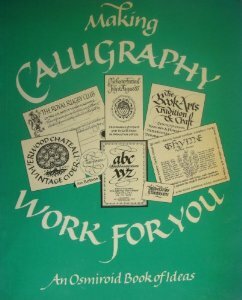 If your own local bookstore has an equally unenthusiastic attitude towards calligraphy (and calligraphers), I can recommend Calligraphity as the place to go for Calligraphy books online. You’ll be spoiled for choice! 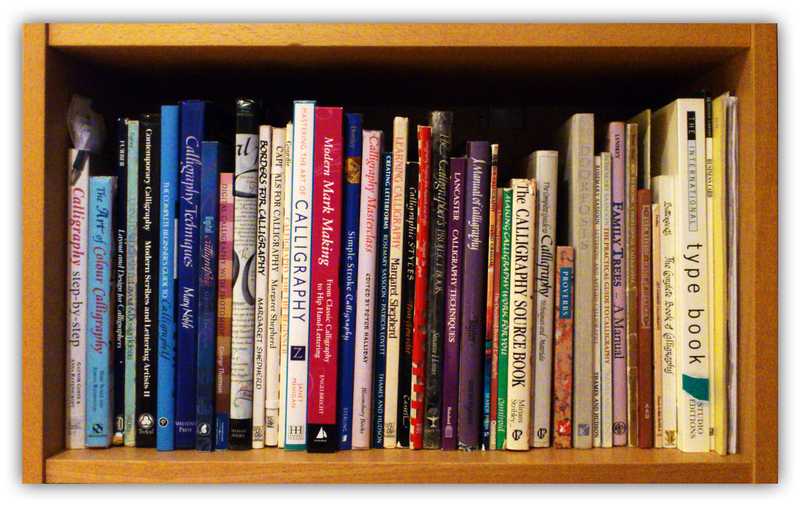 Incidentally, the bookshelf illustrated at the top of this post is my own, and contains some of the many calligraphy books I have collected over the years.